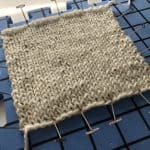 There are several ways to do short rows and I’ve probably tried most of them—wrap and turn, Japanese, yarn over, make 1—and the one that I prefer has changed over the years. For the past several though, I’ve been a wrap and turn girl. Why? It just seems to be the simplest method for me and never produces a hole. If you have a different preferred method by all means continue using it! If it looks good and it works for you then that’s all you need. This article is for Wrap & Turn. You can see our article on German Short Rows as well. Give them both a try! Step 1: Slip the next stitch purlwise. Step 2: Bring the working yarn to the front. 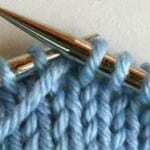 Step 3: Return the slipped stitch to the left needle. Step 4: Turn your work. 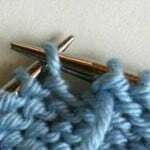 You’ve now wrapped your stitch (in our example it is stitch number 11) and the working yarn is in the correct place for you to begin working the next row. Step 2: Bring the working yarn to the back. 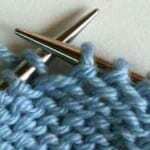 You’ve now wrapped your stitch (in our example it is stitch number 11) and the working yarn is in the correct place for you to begin knitting the next row. IMPORTANT: You DO NOT pick up wraps if you’re working in garter stitch. Knit until you’ve reached the stitch that has been wrapped. The wrapped stitch will be unworked and on the left needle. 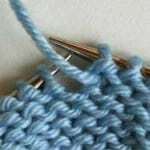 Take your right needle and put the tip underneath the wrap and then through the knit stitch in the same way you always insert a needle when doing a knit stitch. 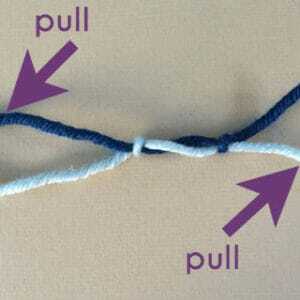 Pull the yarn through to make a stitch. Note that this may take a little finessing to get it working. Slip the stitch off the left needle. Wrap has been picked up and worked—you’re done! Purl until you’ve reached the stitch that has been wrapped. The wrapped stitch will be unworked and on the left needle. Take your right needle and put it underneath the wrap. Lift the wrap and place it on the left needle. Purl both the wrap and the stitch it was wrapping as one—just as you would do a p2tog. Slip both the stitch and the wrap off the left needle. Wrap has been picked up and worked—you’re done! Question: Once you turned do you start working the next row in the pattern? Or do I complete the row & start the next row before I start row 2? Hi Sonia! The next row should be started right there – right after you turn. 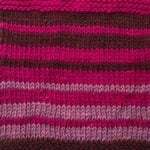 If you’re working a design that asks you to work for X inches, the short rows length WILL NOT be included. This means work 4 sts after the marker, then wrap. So you’ll be wrapping the 5th st. Work as established means to continue the basketweave. i hope i’m not bothering u with another question but there is something i’m confused about on the pattern for example on row 4 after the wrap & turn do i start with row 5 or continue as basketweave pattern says to knit the knit sts and purl the purl sts on row 4? do i make myself clear? No problem! When you’re on Row 4 you’ll follow Row 4’s instructions for that whole row. So, you’ll knit the knit sts and purl the purl sts. 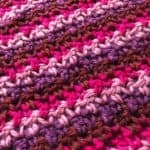 If a pattern simply says to turn your work so I decide what kind of short rows to do? most likely – yes. it can also have you just turn your work. what pattern are you using? Hello, I’m trying to knit a hat called Kiddie Cadet by Kathryn Ivy. While working the brim it says to wrap and turn on the next to the last stitch on each row which also produces a decrease. I can’t figure out how to do that. All the wrap and turn videos I have seen are worked somewhere in the middle of the row. Also, do you always pick up the wrapped stitches at some point? Just work it right where it says. Sounds like it’s to make the curve of the brim (and it will do that). 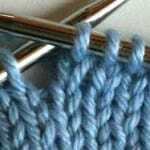 Occasionally you don’t pick up the wraps – most notably in garter stitch but there are other reasons too. 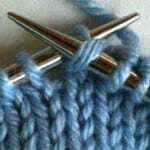 Hi – How do i pick up a wrapped purl stitch on the knit side, like when working in a round? 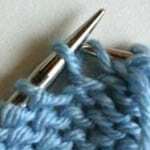 Just follow the steps under the Purl Row instructions for picking up and purling that stitch (steps 2 and 3), but knit or purl up to it like your pattern says. HI! I was actually looking for the same answer to this question but I’m still a little confused. I finished all my short rows, and then I’m supposed to continue my rounds in with knit stitches while picking up the final 2 wrapped stitches. The knit one is easy, but when I get to the one that I was working in purl on the wrong side, I can’t figure out how to pick it up because it’s basically going in the wrong direction. Appreciate any help! You can still pick it up (it’ll just be wrapped in the other direction). The important thing is that the wrap gets hidden behind the stitch. Even though the wrap is on the left side of the stitch and I’m coming from the right side? How do I do that? You can still put your needle under the wrap and then into the actual stitch. I’m currently working on a project that you purl 50, turn, then knit 35 and turn again. When exactly should I pick up the wrapped stitches? After every row or just on one side of the work? The pattern should tell you when to pick them up, but in general you’ll pick them up when working the stitch that includes the short row. So, you never knit the wrap without picking it up first. Yes that makes sense. The pattern doesn’t say to pick them up at any point though… Anyways, thanks you! I am working on the shawl pattern Clarendon by Jen Lucas. This is my first attempt at short rows. The pattern only says turn your work, doesn’t say when to pick up wraps but has a stitch count (369 sts) after some rows. Any suggestions would be greatly appreciated. I looked at the pattern and it looks like it’s stockinette? Assuming so, you’ll want to pick up the wraps when you come to them. I’m wondering if she says to do that maybe in a note at the top? Since I’m unfamiliar with the pattern I’m only guessing – but if you don’t pick them up you’d see where they are. Thank you for the quick reply, I will contact Jen on Ravelry. On the first row you don’t do anything with them. You turn before that. For the next row you’ll have them already on your right needle so you don’t work them either. I’m not sure what pattern you’re making so I can’t explain why you’re doing it. Typically you’ll work more than one shirt row though to build up some angle to it. I am making Pendulum shawlette on Ravelery. The pattern asks you to wrap and turn but nowhere in the pattern does it say to go back, pick up my wraps and knit them. It is knit in garter. Should I assume that I do pick up and knit the wraps? You don’t pick up wraps in garter. Working the wrap itself is all that’s needed. If you picked up the wrap, you’d have 2 strands showing in the purl and it would be more visible. Hi, I’m confused about the pattern I’m working on. It’s in a chart form and the shirt row knitting is indicated like this “2-6-12” which translates: “every two rows, knit to the last 6 sts, wrap and turn; do this 12 times”. Does this mean that I should pick up and knit the wrapped stitch and then continue knitting the last 6 sts for 2 rows? Or should I leave the last 6 stitches unworked? Here’s the pattern: I’m working on the left back chart. Since it’s wrap AND turn, you stop working the row at that point. While I don’t know the pattern itself, I think you’ll progressively work 6 fewer sts for each short row. So you’ll be 6 sts from the end, then 12, etc. I just realized the actual pattern is in the link. Looking at the schematic, what I thought is correct. Every short row you work 6 less sts. Hi! My patterns says : Next two rows : Knit 14, turn and knit to the end. Do I follow this once or twice ? Two rows? It’s a bit unclear to me what the pattern is asking you to do. Those instructions span 2 rows but I’m not positive what it wants you to do. Can you email the designer? Thinking about it some more, I think those are the two rows. Otherwise you’d have a stitch wrapped twice which is very unusual. Hi- I’m working on the Weeble Wooble Cowl- I have follow pattern but it’s not coming out right. I contacted Designer on Raveley and she just said if it doesn’t match its not a big deal. The pattern is worked in Garter Stitch- Knit 50, turn work, Sl1 then knit 119 , turn work, SL1 , then knit to 5 Stitches before end of row. Continue doing this until you have 11 stitches in between. Its not coming out to 11. I’m confused on the the 5th stitch from EOR. I don,t know if that is 5 Stitches or 6 before the SL1 from last row! I’m not familiar with the pattern. But, I would think it’s 5 sts bef the Sl1. So you’d turn when you have this on your needles. SL-k-k-k-k. However, that doesn’t work out to have 11 between. It does if you have SL-k-k-k-k-k so I think that’s what you should do. So, knit until 5 sts bef the slipped st. Yes that does help but when I draw this out on a piece of paper I’m get 9 stitches in between. 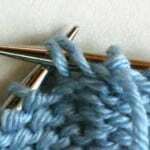 I’m knitting to 50 turn work – Sl1 then knit 119 turn work Sl1 then knit until 5 stitches before Slip Stitch turn work and SL1 continue till 11 stitches! Ugh- apparently I’m skipping something very simple ! IDK. so, the important thing is Sl1, k119. so you have 119 sts between the slipped sts. 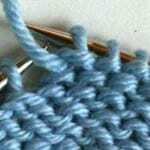 So when I knit 50 turn sl1 and k119 – I’m counting that slip stitch ? No. You start with 119 between the slipped sts. Then you knit until there are 5 knit sts before the slipped st. So, on the left needle you’ll have SL – K – K – K – K – K. This is where you turn. Okay I got that part but what I’m trying to figure out is how can I have 119 between ! If I’m knitting 50 turn work Sl1 knit 119 turn work SL1 then i don’t have 119 between Slipped- I have 118 between . Should I knit 120 ? You’re right! And yes, I believe that’s what the pattern is asking you to do. Like I said, I’m not familiar with the pattern but I believe this is the case. FYI, I did look at the pics on Ravelry but I couldn’t really tell what the cowl was and what the short rows were there for. The short rows are part of the Wooble part of the scarf I believe- lol- there are 3 sets of them around scarf. I think there is an error on the count but I couldnt really get much info from designer- but she said it didnt really make any difference but she has stated on her pattern – 11 between short rows. So I guess I will Knit to 50 Sl1 then knit 120 instead of 119. 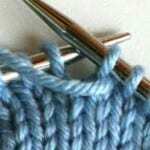 I will subtract 6,6,6 etc until I reach thr eleven short rows. If you have anymore tips for me I would love to hear them! If you don’t – I want to thank you so very much for helping me! My only other comment is that you DON’T pick up the wrap when working short rows in garter stitch. I am knitting a child’ romper which is calling for short rows, I have never heard of this or done it before and am using a circular needle. My pattern says: Back shaping: working back and forth beg shaping back as follows, work 41 sts, turn, sl first st and tighten it slightly, work 81 sts, then turn. 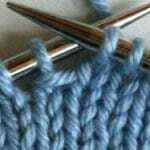 Cont working short-row shaping in this manner, with 8 fewer sts each time 4 times on each side. What does this mean? This is probably a very ridiculous question but I’m making a hat that uses wrap and turn. After two sets of wrapping and turning I have two less stitches than when I cast on. (36 to 34). Does this method result in a decrease or have I messed up? I am wrapping and turning last stitch and then up to a total of 15 wrapped stitches. Next panel repeats with 13 wrapped stitches being picked up. I hope this is clear! Thanks! Unfortunately, no, it doesn’t change the stitch count. Do you want to explain what you did and maybe we can figure out where you’re going wrong? Thanks for getting back to me so quickly, I kinda thought you might say that! I’m going to rip back to where I picked up the wrap and stitch to see if that is where I goofed. If that doesn’t work, I’ll try explaining what I’m doing! So I purl til 5 stitches, w&t, knit to end, turn, purl to 10 stitches, w&t. Then I am lost…every time I w&t do I knit to the end or count another 5 stitches and w&t again? And what does it mean by continue until 5 stitches remain? Thank you I’m so lost! I’ve tried emailing the pattern maker but haven’t had a response. Each time you’re on a WS row you purl 5 sts before the last time you w&t. So you’re creating a diagonal wedge. Since you’re moving closer to the edge, at some point you’ll be just a few sts from it. Hi, I’m working on a hat pattern with circular needles that’s really confusing me. It’s my first time doing short rows. 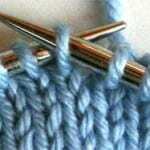 The brim is worked in 2×2 ribbing then 6 short rows with w&t at the end. The 7th row is: ‘Work in ribbing to end of rnd, knitting the wraps together with the wrapped sts’ and the 8th is the same but purling the wraps. I don’t understand what it means by ‘to the end of round’. Is it supposed to be to the last wrapped stitch of row 6 or the original end of round (does that make sense? I mean the first stitch of the pattern with the stitch marker). Sorry if my explanation is confusing. I believe they mean the original end of round. You probably had a stitch marker there. Hi great post. I’m knitting a raglan sweater and have come to the shaping of the neckline be my pattern. 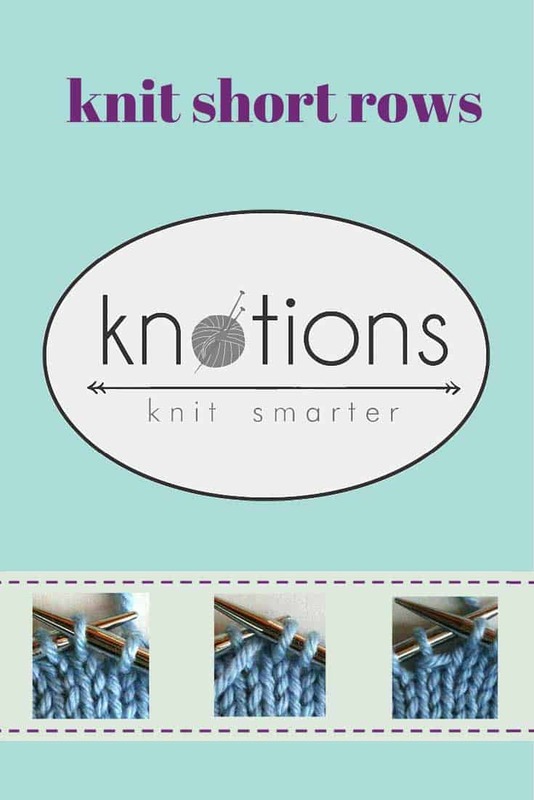 The directions are to start the short rows then it says knit to the end of the row and wrap and turn. I’m confused if I should knit the last stitch or just knit up to it. The pattern is from purl soho. How many short rows total? What are the rest of the instructions for that section? https://www.purlsoho.com/create/2016/05/31/lightweight-raglan-pullover/ here is the link there are 13 short rows I’m also confused on if I should pick up the wraps after every row or wait until row 13. What do you think? Working the wrapped stitches with their wraps as you come to them. So, Rows 1-12, work decreases and wraps. Row 13, knit (including decs) and pick up wraps. I followed these instructions, but just wasn’t sure whether I was doing it correctly. Then I watched a bunch of tutorials (including yours). All of the tutorials don’t turn the work until after the stitch has been slipped, wrapped, and slipped back. Her instructions don’t do that. The work is turned after the first slip. Maybe, it’s just a different way to achieve the same result? I’m looking for some reassurance that her way is ok.
as long as the yarn is in the correct position (and it sounds like it is) you should be fine! 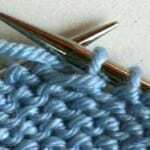 the important thing is – DO NOT pick up the wrap in garter stitch! Are the above steps applied for one row only ? and on both edges of the row ? Is this a short row pattern ? Next row: 4 sts, turn work. Next row: 8 sts, turn. Next row: 1 sl st, 7 sts, turn. Next row: Work even for 1 row on all sts, turn. 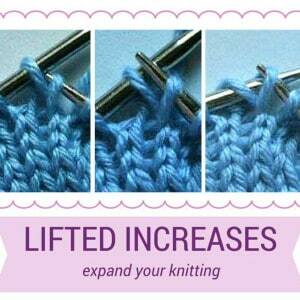 So you’re adding a little triangle of extra knitted fabric just to the right side of the work. I don’t know where this is on the hood so I’m not sure why it’s there. Again, I’m not sure where this is located. My advice is if your edge is on the right (so you’re getting to the edge when you do “1 sl st, 3 sts” and “1 st st, 7 sts”). One more thing I’d do – on the last row where I said “Next row: Work even for 1 row on all sts, turn” I’d add “picking up the wraps as you come to them” UNLESS you’re working in garter stitch. If it’s garter stitch DON’T pick up the wrap. If you do, it’ll make you see it. Thank you very much for your explanation. Your way of writing is clear and easy to follow. It really helps a lot. I’ve tried these steps in one row and get a triangle on both edges. It looks a little bit weird and I’m not sure if it’s correct. I’ve bought this pattern online and tried to asked the author but no reply from them yet. As the pattern is in PDF format so I copy the beginning of the hood pattern here. 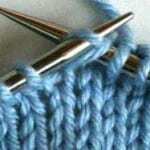 Work in 1/1 Rib for 4 cm (1½ in) [12 rows]. then repeat once more from * to *. 1 st 3 times; every 2nd row 1 st 3 times , 2 sts once. Ok I think you’re creating the little triangles that will make up the space created by the front’s neckline. The repeat once more is having you do the same thing on the other side too. I think it might be an issue of translation of a pattern that started in French so it’s a little odd in English (plus I don’t know where you’re located but it’s in British English). I suspect I’d do the same thing in reverse! FYI each time you do the things in *’s you should only be creating a triangle on one side. That’s great! I can move on to the next row now. BTW I’m from Hong Kong. This is the first time I buy a French pattern and I’m so lucky to find this website. Thanks again for your great help!!! You’re welcome! I hope this helps you! Keep me in the loop on your progress. Are you on instragram? 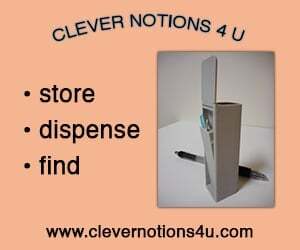 Or join the Knotions Group on fb and tag us there. I’d love to see how it’s turning out! I’m doing the first size, so does the – symbol mean knit right to marker? Do you mean the dash in the last 2 rows? If so, a dash means it doesn’t apply for your size at all. So you do 6 short rows in total. 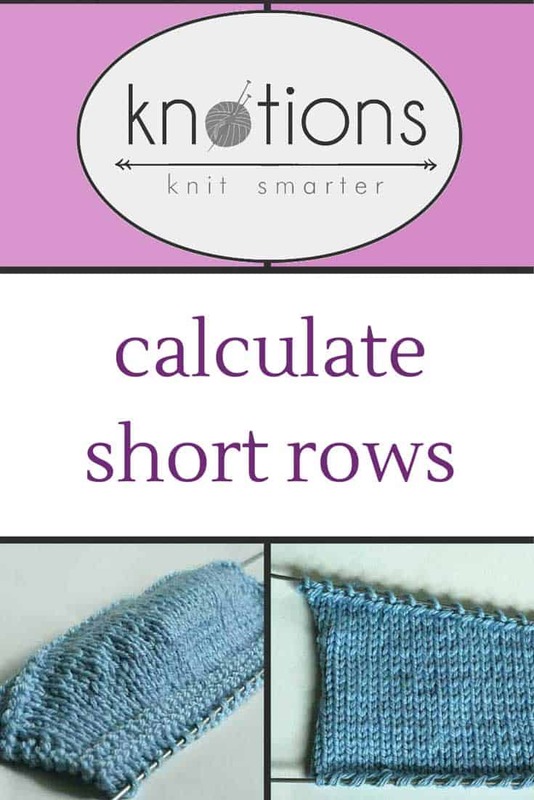 Thanks for this tutorial, I keep messing up short rows because they are always described differently. Having the pics really helps, and you explain it so well. you’re welcome! i’m so glad the tutorial helped 🙂 they’re not really that hard! I’m knitting a pattern from yarnspirations.com , a Bernat Cocoon Cardigan. 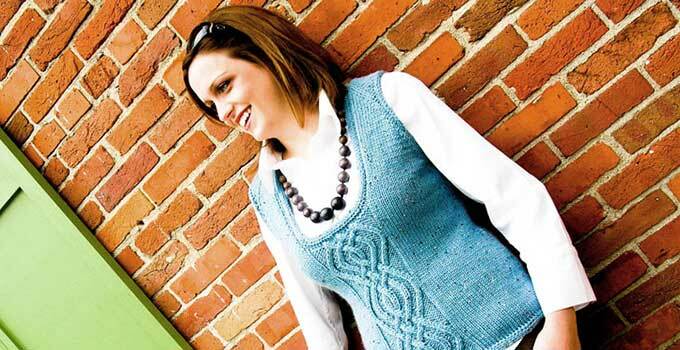 It has a shawl collar form by short rows: Rib 88 stitches, wrap and turn. Rib to 2 sts before previously wrapped st. Wrap and turn. Repeat last row 13 times more — 60 sts remain. My wrap and turns are not creating decreases. I’ve done a few rows and still have 88 sts. What am I doing wrong? You’ll always still have 88 sts but the columns on the right will have more length to them than the columns on the left. That’s what your pattern is doing. Hi, I hope you can help me. This is my first time knitting socks and the pattern states to knit 41 stitches w&t the next stitch. The instructions for the w&t state “Work until the stitch to be wrapped.” w&t next stitch. “Continue across row.” Does this mean I should continue knitting across the same row after the wrapped stitch? I don’t have the pattern, but most w&t have you working the other way at that point. So it’s after the turn part. Hi! I’m knitting a pull-over pattern in the round and am using the wrap and turn technique to shape the bottom edge of the body. I followed the instructions for every row, but at the last one I end up with 2 more stitches on one side of the short row than on the other. Is this normal? Thanks in advance! It’s not normal. My guess is that you either didn’t do them completely evenly or maybe you added 2 stitches. Do you have the number you started with? How did you divide? There should have been the same number in each side when you started. If its says to do 4 turns, would that mean there will be 8 rows? And on every turn should i always work 4 sts before the marker then work back to 4 sts before the other marker? Because if i work the yo’s every time i turn again, there will be lesser sts before the markers. I already emailed the owner of the pattern but no reply yet. Hope you could help me with this. 1. You also need a YO when you do that second turn. You might have just missed typing it but just to be sure. 2. Yes, future short rows will only be 3 sts apart.